December 2018 – A Christmas Pot-pourri! There was an end-of-term feel about the last open meeting as we anticipated the entertainment we were going to witness. We certainly weren’t disappointed. 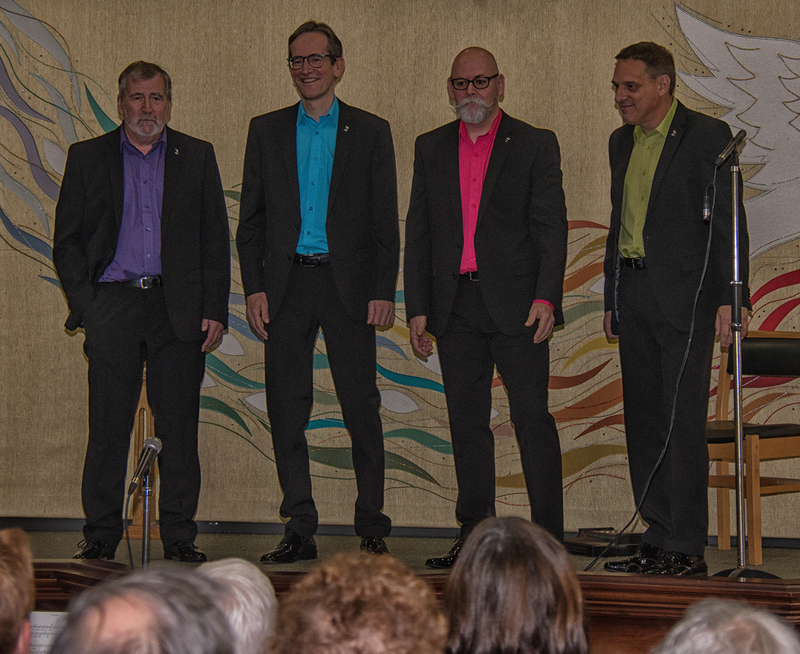 The Barber Shop quartet, Bill, Nelson, Mike and Brian, which opened the proceedings, gave us a polished mixture of recent songs – e.g. Eight Days’ a Week – and some old faithfuls – e.g. Mary Lou. They also gave us a brief history of the origins of what has become known as ‘Barber Shop’ singing. 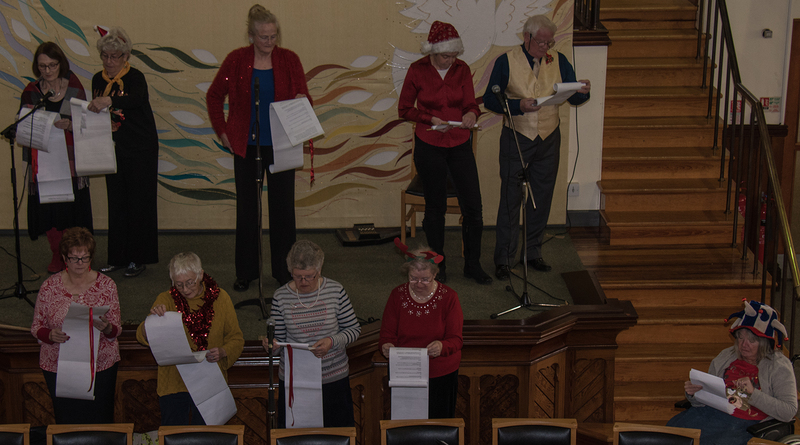 They were part of the Grand Centre Chorus which is an East Midlands group of men who specialise in Barber shop singing. Their enthusiasm was infectious and it was lovely that they were able to attend our end-of-term party. The Play Reading Group followed with an amazing version of ‘Aladdin’ or to be accurate, ‘Albert Ladin’. The cast were inspiring particularly the Genie and Princess Shushine. The costume changes and special effects had us gasping with admiration. The lack of rhyming couplets from some cast members in no way detracted from the overall polish of the production. The contribution from the ‘Let’s Right Shakespeare Group’ only served to underline what has been said for years: Shakespeare is full of quotations. The number of common/well-known sayings which can be attributed to the bard is staggering. The group recited a list that was comprehensive but not, I suspect, complete. I’m sure we all use at least one in our everyday converse. What was a revelation came in the second part where it became obvious that our Will was recycling long before it became fashionable. Having read us a long list of well-known phrases, the Group then proceeded to tell us which plays these phrases were from. Several appear in more than one play, but then if you’ve got a neat turn of phrase why not use it again? There was a break in the seasonal jollity to announce the winner of the short story competition. The competition had been announced earlier in the year and so the results were eagerly anticipated. 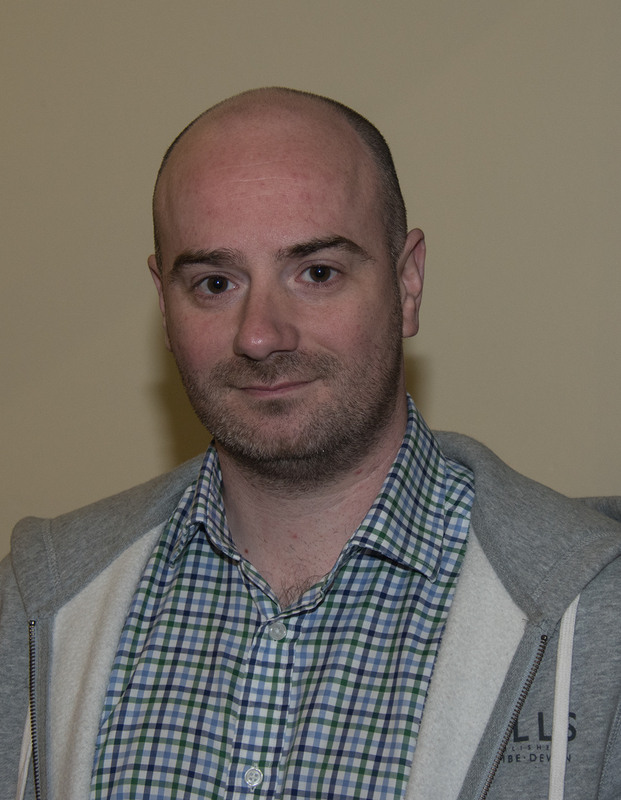 Helen Stewart told us there had been 34 entries which had been narrowed down to 18 and a final short list of 5 which were judged by the local author Sam Maxfield who narrowed it down to a final three, Peter Hilton, John Gallagher and Sue Daly. Sue from Ilkeston was declared the winner. The judge commented that her story ‘Man Upstairs’, had a light touch, an interesting ending and sparkled. Congratulations Sue! (See page 16 for more details, and the winning story). 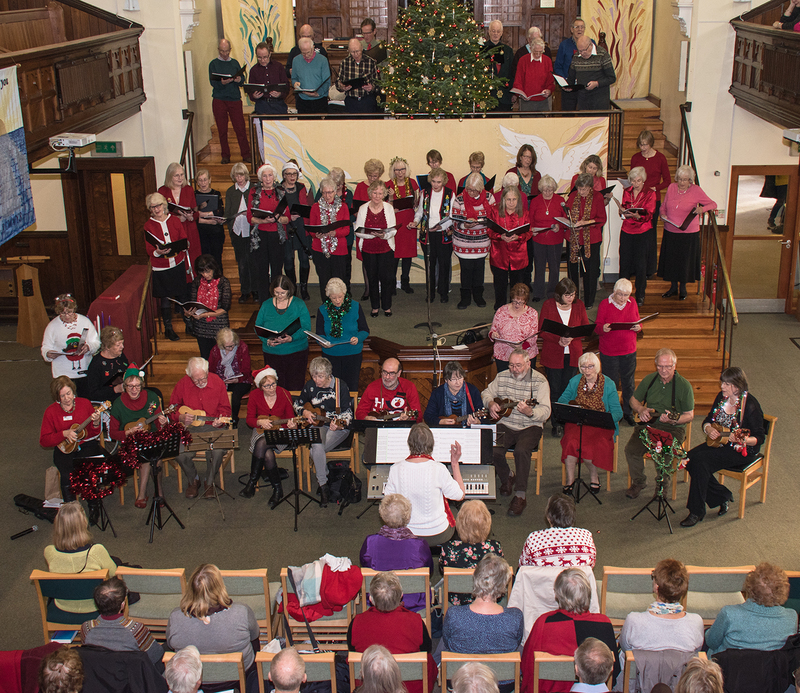 The finale was a combined effort by the ‘Singing for Fun’ group and the Ukulele Players. Their joint and single efforts gave us all the seasonal favourites including ‘Oh! Holy Night’ ‘Red, red robin’, ‘Jingle Bell Rock’ and finally, ‘We wish you a Merry Christmas’. Of course! Below are photographs taken by Mike Johnson at the meeting. 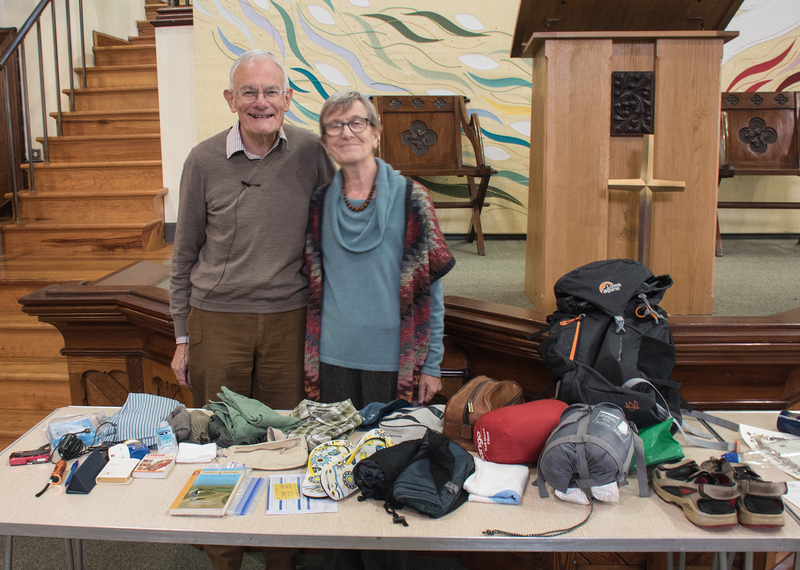 David and Anne Curnock gave a talk ‘Walking the Camino in Northern Spain’. Those belonging to Anne and David Curnock certainly were, they walked over half the Camino de Santiago from Asturias airport to the Cathedral in Santiago de Compostela where, along with many other pilgrims, they attended the noon service which takes place each day and is for all pilgrims who have completed the walk. The route is well signposted with the characteristic shell on the waymarkers. Anne and David brought their back packs with them to show what they had carried. We were told that for serious walking your back pack should not weigh more than 10% of your body weight so you have to think about your luggage carefully. Apart from the obvious items of clothing and basic first aid they brought their ‘Pilgrims Passport’ to show us. This is a document which is stamped at every stopping place along the route and also helped them find accommodation. It is embellished with the scallop shell which is the sign of St James. According to legend he spent 11 years in Spain and after he had drowned, his body was washed up covered in scallop shells. They met many interesting people along the way and saw some beautiful scenery; old Roman bridges, quaint little churches, at 4,940 feet above sea level, an iron cross atop a wooden pole surrounded by small stones laid there by pilgrims. Frequently they met people whom they had passed on the way at the inn where they spent the night and could swap travellers’ tales. The increasing popularity of the pilgrimage is boosting the economy of the area. The number of pilgrims rises every year and so does the available accommodation. Why do the walk? Anne and David did it because they had always wanted to, others do it out of curiosity, as a challenge, as a time to reflect or for spiritual reasons. The service in the Cathedral seems a fitting climax. There is a special pilgrims’ entrance and, because of the numbers, no rucksacks are allowed. There is an enormous incense burner inside which takes 8 strong men to elevate and swing. No doubt in days gone by the smell of the pilgrims might have needed much incense to make the air more pleasant! On the roof of the cathedral is a place where pilgrims can burn their clothing – both a practical and symbolic gesture. It was interesting to hear from two people who had actually done something which many of us might have thought about doing..
Kurt gave us a comprehensive tour of the work of Watson Fothergill who was born Fothergill Watson in 1841. He was the son of Robert Watson and Mary Ann Fothergill. He changed his name to Watson-Fothergill in 1892 because he wished to perpetuate the Fothergill name. He studied architecture in Nottingham and set up in practice in 1864. He is variously described as Nottingham’s flamboyant architect and the father of the Gothic revival although many feel that this title more accurately belongs to Pugin. His work is distinguished by many strange and unusual additions; towers, carvings of animals, famously a monkey representing the weight of the mortgage that was outstanding on a building, horizontal bands of red and blue brickwork, timber eaves and balconies and stone carvings. He designed over 100 buildings in Nottinghamshire including shops, warehouses and houses, some of which still stand although their function may have changed. We will be aware of the Express Chambers building on Upper Parliament Street, originally newspapers offices but now used for different purposes. For many years he had his office on Clinton Street but had to move from there in 1895 when the land was purchased for the arrival of the railway and the building of what was then the Victoria Station. He moved across the road initially to 18 George Street and later to 15 George Street to occupy the offices which he had designed and in which he remained until his retirement. Several houses in the Park were built to his plans. Edale house on Clumber Road East, houses on Cavendish Crescent, Newcastle Drive, Hope Drive, Park Row. He designed affordable housing, now long gone in St Ann’s in 1891, the Mary Norris funded alms houses on Woodborough Road and the building which is now the Pakistani Centre. Public houses, and places of worship were all grist to his mill both in Nottingham and Mansfield. It is interesting to walk around the city and try to see how many of the works of this son of Nottingham one can spot.